Preheat the oven to 450 F. Lightly butter a baking sheet or line it with parchment paper. Sift the flour, salt, and baking powder together. Place in either a medium mixing bowl or the workbowl of a food processor. Cut the butter into the flour so that it is completely incorporated. This may be done using two knives, a pastry blender, your hands, or in a food processor. Beat two of the raw eggs and the cream together, and add to the dry ingredients. Mix as little as possible to incorporate the eggs into the flour and butter. Fold the cheese, scrambled eggs, and bacon into the flour mixture. It will be a sticky, chunky dough. 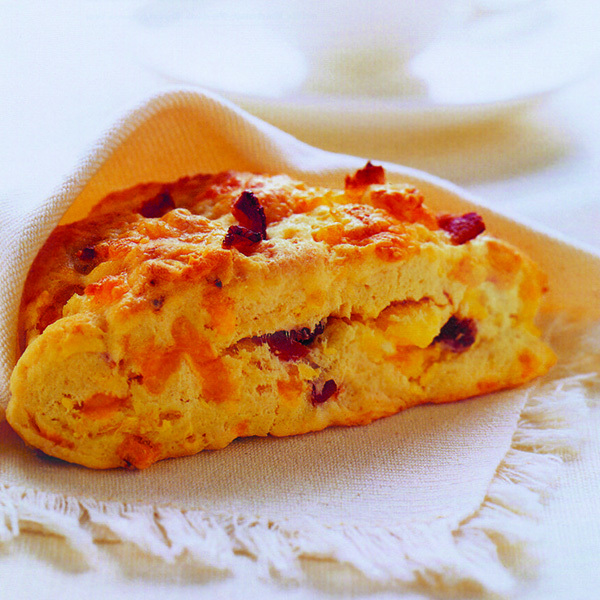 Stir and knead the scone dough as little as possible while distributing the cheese, scrambled eggs, and bacon into it. Transfer the dough to a well-floured, flat surface. Pat the dough into a rectangle about 12 inches long, 4 inches wide, and 3/4 inch high. Cut the dough into 4-inch squares. Cut the squares on the diagonal to form triangles. Place the scones on the baking sheet. Beat the remaining 1 egg with the water and use this wash to brush the tops of the scones. Bake 10 to 12 minutes, or until golden brown. Remove and serve warm.